The best table saw reviews take the experiences of many different owners into account. If you have done much woodworking tool research at all, you know that most products have some owners that love them, and other owners that are not happy at all with exactly the same item. Different people have different needs and expectations. To get a good "feel" for whether or not a particular woodworking tool is the right one for you, it is best to get a number of different opinions. That way you can see if particular comments or complaints pop up repeatedly, and you can also get a good idea about the reliability of a particular model. That is precisely what I have done for the table saw reviews listed below. I have gathered information from all the different online retailers, forums and magazines that I could find, and compiled the reviews for specific brands and model numbers. I have also listed the important features and specifications for quick and easy comparisons of different models. If there are common complaints about a particular model, you will find those too. Bosch Table Saws: The Bosch 4100 series is regarded by many as the benchmark in portable table saws. It has won several magazine comparison tests, and gets great reviews overall. There are three different models. The 4100 is the benchtop saw by itself. The 4100-09 is the same machine, but with a gravity-rise folding cart that gets lots of praise. The 4100DG-09 is also the same saw, with the gravity-rise stand AND a digital fence readout. I found over 300 table saw reviews of the Bosch 4100 series. In 2011, Bosch introduced a new compact table saw, the GTS1031. It is a smaller, lighter weight saw than the 4100, designed to provide the ultimate in portability. You can carry it with one hand! It is very similar to the Dewalt DW745, but offers a slightly larger rip capacity (18") and also will accept a 1/2" dado blade, whereas the Dewalt does not accept a dado. Delta Table Saws: The "new" Delta Unisaw was introduced in 2009, and owners really like it a lot. There are four different models, all based on the same machine. Basically, you have a choice of a 3HP or 5HP motor, with either a 36" fence or a 52" fence. In the past, Delta has offered contractor saws and portable saws, but the new Unisaw is the only line they have available at the moment. Dewalt Table Saw: Dewalt currently offers three models of portable saws, the DW745, the DW744X, and the DW744XRS. The DW745 is one of the smallest and lightest pro-quality saws out there. Owners love the rack and pinion fence, and it gets great ratings overall. The DW744X is a little larger, and comes with a folding stand. Overall ratings on this one are not quite as good, mostly due to some issues a few years ago that have apparently been resolved. The DW744XRS is basically the same tool as the DW744X, but with a fancier collapsible rolling stand. Grizzly Table Saw: Grizzly has more tablesaw models available than almost any other company out there. They are regarded as an excellent value, and frequently win the "Top Value" award in the magazine comparison tests. Their offerings range from an inexpensive contractor saw to huge industrial-duty 14" sliding tablesaw. In between, they have a wide range of hybrid and cabinet saws with both 10" and 12" blades. Most owners are VERY pleased with their Grizzly tablesaw, and most agree that you can't beat one for the price. In general, the Grizzly model line offers the same features and quality of machinery that costs hundreds or even thousands more. Grizzly table saw reviews are really good overall. Hitachi Table Saw: DISCONTINUED The model that is reviewed here is the C10RB. It is a lightweight, portable saw that comes with a folding stand. Reviews on the C10RB are few and far between, and some that you will find listed under this model are actually for an older version. The Hitachi table saw ratings aren't stellar, averaging less than 4 stars. Honestly, for the money, I would probably look at a Dewalt, Ridgid, or Bosch model instead. Makita Table Saw: The Makita 2705 is currently the only model they offer. It is a benchtop saw, but it can be bought with a rolling, folding stand as the 2705X1 model. If you are going to be moving it around much, the version with the stand is preferable, because the Makita is a little heavier than most portable table saws. It gets good reviews overall. Porter Cable Table Saw: Porter Cable has two different models available at the moment. 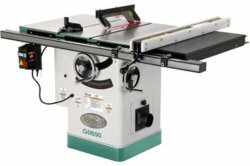 The PCB220TS is a portable tablesaw that comes with a rolling and folding stand and has an extendable outfeed support. The PCB270TS is a contractor table saw with an integrated caster system and a 30" rip capacity. One comment that popped up repeatedly in the Porter Cable table saw reviews is how great of a value they are for the money. Powermatic Table Saw: Powermatic makes professional quality machinery that is priced accordingly. They currently have one contractor saw and 17 different cabinet saws available. The contractor table saw ratings are good, but not great. The cabinet saws fare somewhat better. One thing that showed up repeatedly in the Powermatic table saw reviews is the great customer service that was provided when someone had an issue. Ridgid Table Saw: Ridgid currently offers two models. The R4510 is a portable table saw that comes with a rolling, folding stand. It is a little heavier than many jobsite tablesaws, but that makes it a little more stable too. Most owners love it, and the R4510 table saw ratings are above average. The R4512 is a value-priced contractor saw that seems to be a great buy for the money. On our Ridgid review page, we also have information on a since-discontinued benchtop tablesaw, model R45161. Shop Fox Table Saw: Shop Fox is a brand by Woodstock International, and they currently carry four different cabinet saws plus a hybrid table saw. One cabinet saw model has a 12" blade, and another model has a sliding table. The Shop Fox machines are very similar to certain Grizzly models, and the two companies are both owned by the same person. There aren't a lot of Shop Fox table saw reviews out there, but the ones that I found were very positive. Skil Table Saw: Skil currently has three small table saws available: a benchtop saw, one with fixed legs, and one with a folding stand. Each of these are different machines, not just the same one with different attachments. These are inexpensive tools, and the Skil table saw reviews show it. I do think, however, that some people expect $500 performance out of a $250 machine, and that is a big reason for the relatively low Skil table saw ratings. For the average homeowner that needs a tablesaw occasionally, there really isn't any reason a Skil model will not fulfill their needs. Some professionals use them because they are so inexpensive, they are less likely to "develop legs" and disappear. They are also light weight and easy to move around. Note: If you are buying your first table saw, or need help tuning up one you already own, I would recommend getting a good book on the subject. The two that seem to be recommended most often on the woodworking forums are Jim Tolpin's Table Saw Magic and Kelly Mehler's The Table Saw Book . Both have good ratings on Amazon, and they cover all the basic operations, as well as safety, maintenance, and accessories. There are other brands that are definitely worth a look that I haven't reviewed yet. Sawstop table saws get good reviews, and their safety technology is awesome - I have two family members that have missing or mangled fingers that a SawStop machine would have prevented! General International also seems to have quality machinery, and Jet Tools has a large number of good-quality options to choose from. I will be adding table saw reviews on these brands and others as time permits.